Ontario – A Potential Greek Tragedy? Ontario’s deficit dropped to $9.2 billion in 2012-13, due in part to one-time savings from labour contracts and negative spending growth, Finance Minister Charles Sousa reported Tuesday. “Our balanced approach of fiscal discipline, responsible management and strategic investments continues to help grow the economy, create jobs and reduce the deficit,” said Sousa. Sousa said part of the reduction in red ink came from one-time savings from new contracts negotiated with teachers and other public sector workers. He predicted the deficit for the current fiscal year will rise to $11.7 billion but said the province remains on track to balance its books by 2017-18. Meantime the province’s overall debt continues to climb, jumping to $252 billion, but Sousa insisted the ratio of Ontario’s net debt-to-gross-domestic-product was in far better shape than most jurisdictions. This headline gives an impression of good news as Ontario’s 2012-13 deficit was only $9.2 billion. But, given that Ontario’s current debt load is $252 billion and growing, this is hardly good news. Starting in 2003, Ontario Premier McGuinty’s government embarked on a decade-long spending program, and Premier Wynne is following his lead. 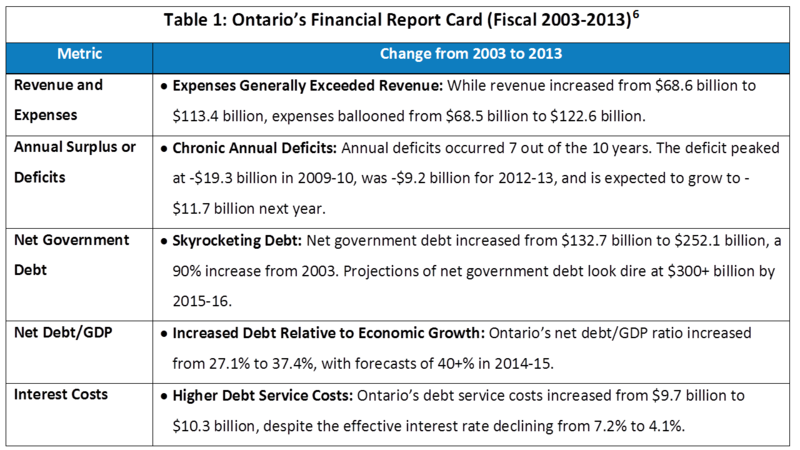 Table 1 provides a sobering snapshot of Ontario’s key deficit and debt metrics over the decade, and its report card is weak: escalating annual deficits, a significant increase in government debt, a deteriorating debt/GDP ratio and higher debt-service costs, despite significantly lower interest rates. 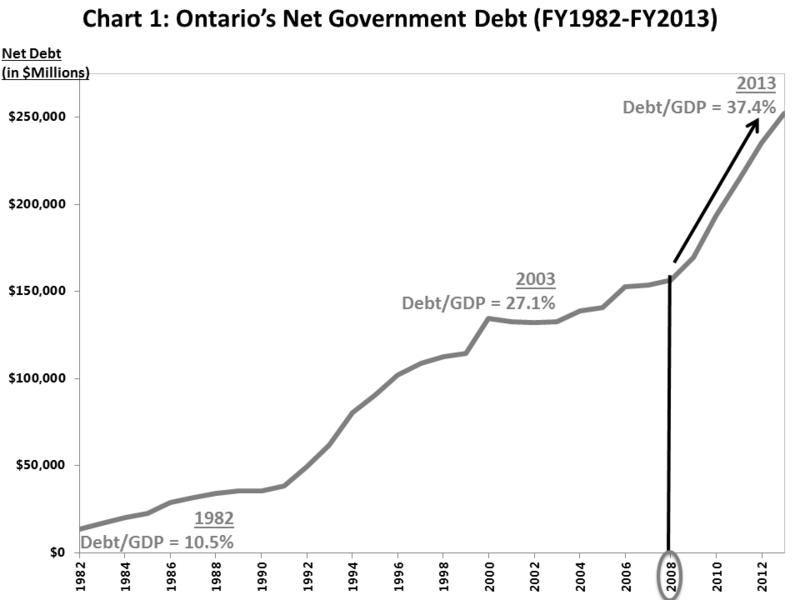 Ontario’s net government debt continues to increase, despite four years of economic growth. If interest rates rise and/or the economy slows the debt load will increase quickly. Minister Sousa commented on Ontario’s challenging predicament: “The single most important step the government can take to secure Ontario’s prosperity and help create jobs is to eliminate the deficit.”7 Of course, Sousa is trying to convince us that Ontario will soon be on a path to a balanced budget … sometime after 2018, assuming the government’s rosy economic projections materialize. Ontario – Getting on Track or a Train Wreck? If Ontario’s debt trajectory continues, it won’t take long before we cannot get on track. A Fraser Institute’ publication forecasts that Ontario’s net government debt could reach 60-70% of GDP by 2019-20.12 If not addressed, the dramatic increase in Ontario’s debt will affect the quality of services, including education and healthcare. As Ontarians, we must recognize that the only options are higher taxes and/or lower government spending. Nevertheless Ontario is in much better shape than Japan, which we focus on next. Given that Japan is the world’s third largest economy, it’s essential for us to understand its growing debt problem.